Handel’s “Messiah” as Apologetic | J.W. Wartick -"Always Have a Reason"
Handel’s “Messiah” is one of the greatest pieces of music ever composed. It has been performed constantly since he wrote it. There is no doubting the enduring popularity of the piece and the way it brings comfort to God’s people. It is often played during the Christmas or Advent seasons and has become a way for many to hear the message of Christ during this time. One aspect that is not often explored, however, is the way the piece may be seen as an apologetic for Christianity. Calvin Stapert, in his work on the piece, Handel’s Messiah: Comfort for God’s People, notes how the work was written in part as apologetic. The biblical selections which were put together to form the lyrics of the performance were selected by Charles Jennens, whose brother had committed suicide during some doubt-inducing talks with a famous deist (77-78, cited below). Moreover, Christian apologists during this time–during the height of Enlightenment–were beginning to realize that simply making arguments from natural revelation or reason alone was in some way to not engage with the Deists who were at large. After all, Deists could agree God existed. The question was which God and whether God was personal. So although the arguments of natural theology were helpful, they could not do all the work on their own, and Christian apologists set about the task of proving Christianity through the Scriptures (75-77). By simply putting forth a different narrative than that of the Deists, Handel and Jennens challenged the notion that God was impersonal. Moreover, they pressed home the need for a savior due to our own futile raging against God. The beauty of he piece serves to enhance its apologetic narrative, making it entice the heater to keep listening. The music forges links between the notion of he need for a savior and the Incarnate Son. The Messiah, then, is part of this project. It is a story of prophecy and the way that God sent the Son into the world, incarnate in the flesh, to bring about salvation. It is a masterful interweaving of Old Testament prophecy and New Testament fulfillment. More than that, it is an apologetic voice in the wilderness. 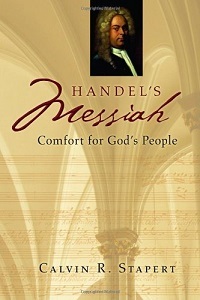 Calvin Stapert, Handel’s Messiah: Comfort for God’s People (Grand Rapids, MI: Wm. B. Eerdmans, 2010). What a thought: Handel’s Messiah as an apologetic! I appreciated this blog because I would have never thought of Handel’s MESSIAH as an apologetic at all. Blessings! Could you name a couple or a few Christian Apologists from the Enlightenment period? J. W. invited me to post a few titles in response to your question. Though by no means exhaustive, this list of a few dozen works should give you some sense of how vigorous the apologetic effort was in the Enlightenment. Most of these books can be downloaded from Google Books or the Internet Archive. J. W. invited me to post some titles in response to your query. This list of about three dozen titles, which is by no means exhaustive, will give you some sense of the vigorous apologetic industry in England during the Enlightenment. Most of these works can be downloaded from Google Books or the Internet Archive. Well, thank you very much for the list. I would have never guessed that the defense of the Christian faith was so strong then with Christian writing. It may take a while, but hopefully I will get to these works some day.